Villefranche sur Mer is an exclusive holiday destination on the Cote d'Azur. Residence Royale selected several luxury villas in Villefranche sur Mer all with private pool and stunning sea view. Rent one of our luxury holiday villas and discover Villefranche sur Mer and Cap Ferrat. This luxury villa is for rent in a quiet area in Villefranche sur Mer on the Cote d'Azur (France). 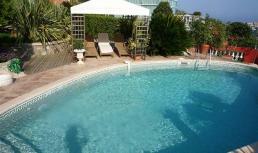 Villa Villefranche sleeps 10 and has a heated pool, air conditioning, WiFi internet and sauna. Splendid villa with breathtaking view of the Bay of Villefranche!